If I mention African wildlife, undoubtedly images of charismatic megafauna come immediately to mind: giraffes, lions, elephants, rhinos. But Africa is also home to more than 3000 species of fishes, some of them wickedly cool species that are the last remnants of ancient lineages dating back more than 100 million years ago. Many modern representatives of those lineages have evolved fascinating adaptations for survival: they can breathe air, some can “hibernate” for years, one can even fly! I’ll introduce you to several of these amazing ancient fishes, including examples of their impact on current research. Take a deep breath and relax: African lungfishes do! Lungfishes are among the oldest extant lineages of fishes, dating back nearly 400 million years ago. Six species are alive today, one each in South America (Lepidosiren paradoxa) and Australia (Neoceratodus forsteri), and four species in Africa (Protopterus spp.). As their name implies, African lungfishes have lungs and breathe air. Although lungfishes have gills (they look similar to larval salamanders when young), they quickly switch to almost entirely air-breathing by the time they are juveniles. During periods of drought, African lungfishes are unique in that they can survive near-complete desiccation (drying out) by estivating: undergoing a period of slowed metabolism, almost like hibernation. (The South American Lungfish can partially do this, but the Australian Lungfish cannot). Scientists have tested African lungfish estivation in the lab and found they can be revived even after seven years of “sleep!” Not all African lungfishes need to estivate, however; some (like the Marbled African Lungfish Protopterus aethiopicus) inhabit the open waters of large lakes like Lake Victoria, where they are also components of local fisheries. African lungfish physiology is certainly impressive, but so is their morphology; they don’t have teeth in the traditional sense, but instead possess tooth plates that work together like gears in a machine, providing a powerful bite (all the better to crush hard-shelled invertebrates and fish). These tooth plates are often used by paleontologists to identify fossil lungfishes. The West African Lungfish (Protopterus annectens) has even helped us better understand the vertebrate transition from water to land. Scientists observed lungfish locomotion in aquaria using high-speed video cameras and found evidence suggesting that “walking” behavior evolved prior to vertebrates moving onto land (King et al. 2011). The African Butterflyfish (Pantodon buchholzi) may be small, but it packs some surprises for both predators and prey. Like its distant relative, the giant Arapaima of the Amazon, the African Butterflyfish is also an air-breather, but only grows to about five inches long, and is found primarily in the Congo and Niger River basins. Living at the top of the water column, the positively-buoyant fish floats just below the surface, ready to eat unlucky invertebrates or smaller fishes. However, if a predator arrives, it can use its large, upturned pectoral fins to launch out of the water and “fly” to a safe distance. This airborne behavior also aids in hunting insect prey. As if those features weren’t impressive enough, research has shown the African Butterflyfish to express significant “morphological stasis” (i.e. consistent shape) compared to its genetic diversity. Lavoue et al. 2010 compared populations between the Congo and Niger River basins, and while genetic differences were significant between the populations, the outward, physical appearance (morphology) had not changed in more than 50 million years! A “Biker” Gang of Dinosaur Eels? Truly an oddity among fishes, the bichir (usually pronounced “biker” or “beh-sheer”), was a long-time conundrum for ichthyologists, and still provides some evolutionary surprises today. 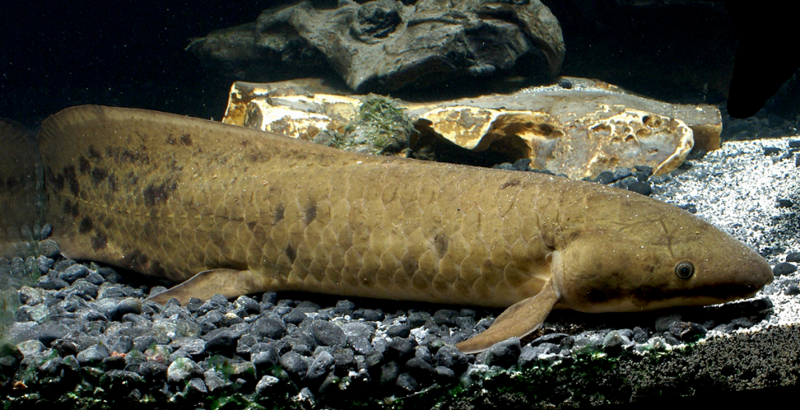 With an elongate body armored in thick, ganoid scales, and jaws full of sharp teeth, one may think they are related to the North American gars (Lepisosteidae), but the similarities end there. Along with the Ropefish (Erpetoeichthys calabaricus), bichirs (Polypterus spp.) comprise the family Polypteridae, and possess a row of small dorsal spines, or “finlets”, that look almost like spikes on the back of a dinosaur. In fact, bichirs are sometimes called “dinosaur eels” in the aquarium fish trade. Adding to their bizarre appearance, and confusing scientists for decades, bichirs also have lobe-like pectoral fins, which led some early taxonomists to place bichirs closer to lungfishes and coelacanths (true lobe-fin fishes), but further study established bichirs as true ray-fin fishes. Polypterids move their “lobed” pectoral fins in an almost fluttering fashion to swim across the bottom substrate, or frequently to the water’s surface to take a breath of fresh air (that’s right, they’re air-breathers too, but they use primitive “blow-holes” called spiracles to do it)! Presently found only on the African continent (with fossil ancestors in South America), bichirs were recently the subject of research that helped scientists better understand the evolutionary vertebrate transition from water to land. Polypterus senegalus were kept in damp terrariums and raised on land for a year. They were then compared to traditional, aquatic counterparts. The differences observed in movement, muscles, and skeletons between the two groups were striking, showing that within a relatively short time these animals could adapt to “life on land” (Standen et al. 2014). This Fish Doesn’t Live in a Vacuum; It is a Vacuum! The African Arowana (Heterotis niloticus), or more accurately, African Bonytongue, is not nearly as colorful as its true arowana cousins, like the South American Silver Arowana (Osteoglossum bicirrhosum) or the stunning Asian Dragonfish (Scleropages formosus), but it does possess some unique traits of its own. With an elongate body covered in large, gray scales, the African Bonytongue is more closely related to the South American Arapaima (sharing the same family, Arapaimidae); like the Arapaima, the African Bonytongue is also an air-breather and exhibits parental care for its young. Compared to its carnivorous relatives, however, the African Bonytongue is unique in that it is an omnivorous filter-feeder, often siphoning the bottom substrate for invertebrates and small seeds; they even have a sand-filled gizzard to help the digestive process! An important food fish in West Africa (estimated annual harvest in Benin valued at $1.5 million USD; Adite et al. 2005), scientists are trying to find more economical ways to utilize this species in aquaculture, particularly by reducing the amount of fishmeal in feed (the most expensive component of production). The latest results are promising, as new research indicates African Bonytongues can grow just as well on feed with 50% fishmeal substitution compared to 100% fishmeal (Goure-bi et al. 2018). From the Great Lakes of North America to the Great Lakes of Africa’s Rift Valley, freshwater biodiversity is under threat. Even these few examples of ancient fishes can teach us about our evolutionary history as well as providing economic value. It’s important that we conserve this biodiversity for ecosystem resilience and as proper stewards of our natural resources.